Is there anything better than waking up early on a Saturday to attend a gathering of SoCal's best gourmet food trucks? This festival is used as a fundraising event for the school district so admission was $6 presale, $8 at the door. 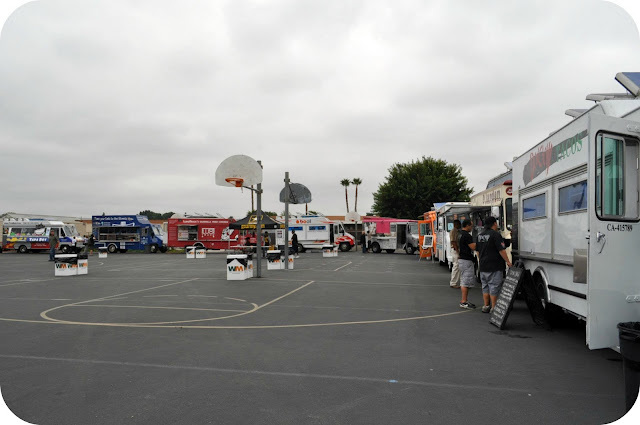 There were a good amount of trucks at the event...so many that I wasn't able to try EVERYTHING but I did get a good variety of eats...let's check them out, shall we? Take a look at that. Isn't it beautiful? Don Chow is famous for their Chinese-Mexican fusion menu which includes chimales, kung pao chicken tacos, and the Don Chow Fun bowl. I ordered the three taco sampler. 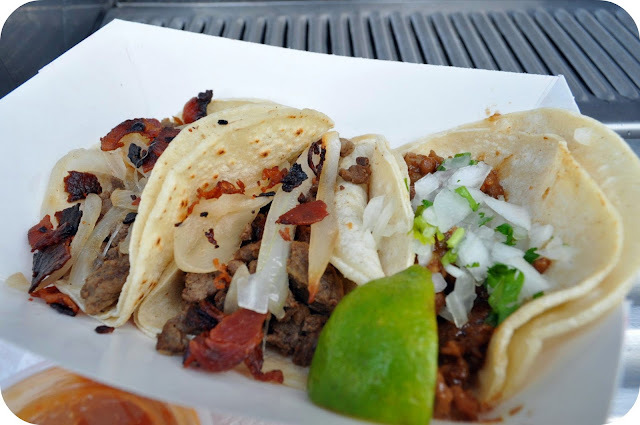 It comes with an L.A. style carne asada taco (topped with bacon and grilled onions! YUM! ), a kung pao chicken taco and a chinese bbq pork taco. My brother was with me so I subbed out the kung pao chicken for another carne asada taco. Can I just say how much these tacos made me want to CRY? They were insanely delicious. The sweetness from the bbq pork balanced out the hot salsa. And not to mention salty bacon and sweet grilled onions really made that carne asada taco stand apart from any taco I've ever had. I really have no idea how no one has caught onto how amazing flavors can be born from the fusion of chinese and mexican food. The hot salsa was definitely the kicker to these little bundles of yumminess. I've had the Buttermilk Truck once before and it totally rocked my foodie world, so as a new fan I had to partake in some more of their breakfast goodness. 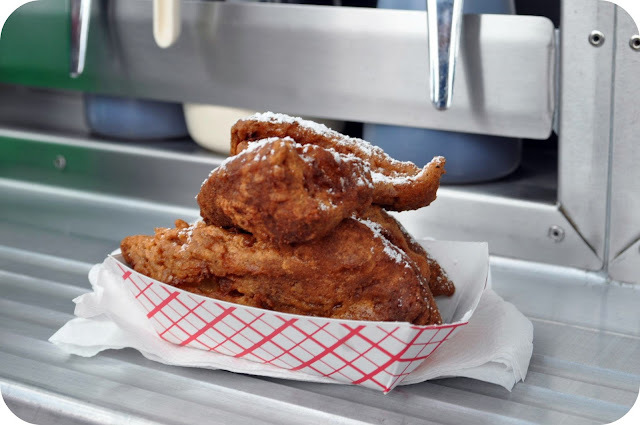 The Buttermilk Truck menu is one I would truly call gourmet. McDonalds who? 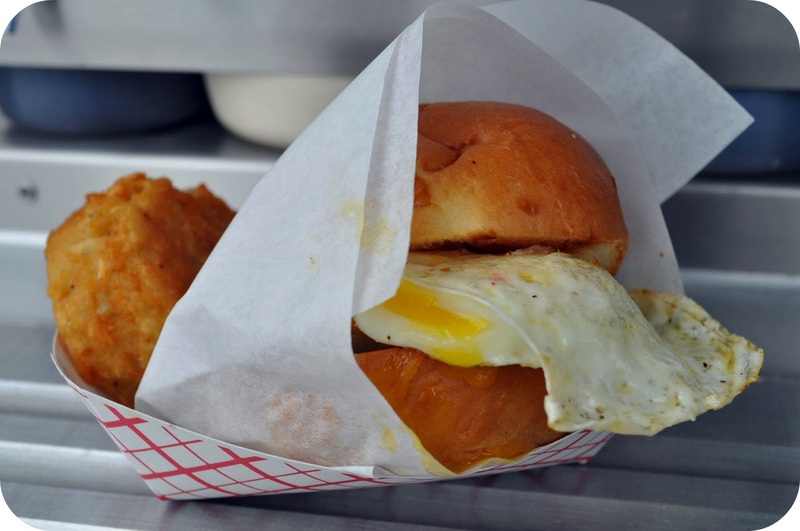 This breakfast sandwich will throw your taste buds for a whirl all the while questioning why Buttermilk doesn't have a drive thru so you can pick up these babies daily. The sandwich is made up of an over easy egg, your choice of applewood bacon, tocino or my personal favorite choice: chicken apple sausage; and cheese all cushioned between a buttery brioche bun. For a dollar extra you can include a rosemary garlic hashbrown. Yes, you read that correctly. ROSEMARY. GARLIC. HASHBROWN. In the words of Rachel Zoe: "I die." The hawaiian bread french toast looks like fried chicken from the angle of my photo but have no doubt that these things were anything but your typical french toast. The battered outside of the french toast was perfectly golden brown and crunchy, yet the inside was as fluffy as a cloud. Because the bread is hawaiian bread it is a little sweeter than normal french toast, but it's so thick and perfect that you won't even mind. Go ahead, throw some maple syrup on that paper boat of deliciousness and enjoy. This was a new truck for me so I was definitely excited to try out the fare they had to offer. They're known for their "Jersey Style Fried Dogs" but I opted for the Iggys. The Iggys are basically sliders but taken to the next level. It's angus patties, american cheese, grilled onions, pickles and their special sauce...oh did I mention it's on a Kings Hawaiian Roll? I really could have scarfed down a few of these but because I'd already tried some other things I opted to stick two. The taste reminded me of a White Castle burger if it was on steroids. 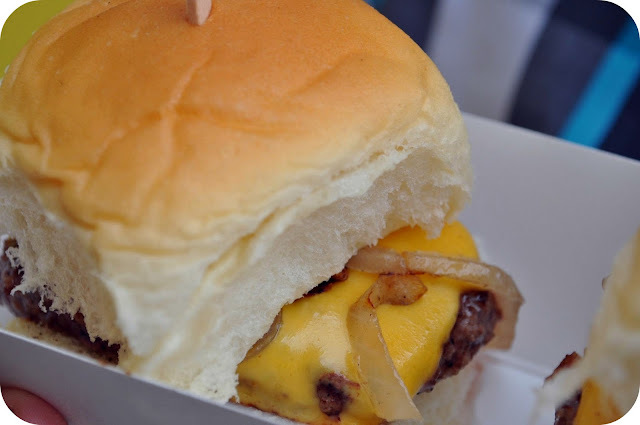 The sweetness of the grilled onions and the roll really made these sliders stand out as something different. I'll have an opportunity later this week to try out this truck again so I'll let you guys know how the hot dogs and curlys are. Cool Haus Ice Cream Sandwich Wrapped in an Edible Wrapper! This was a perfect ending to such a savory day. 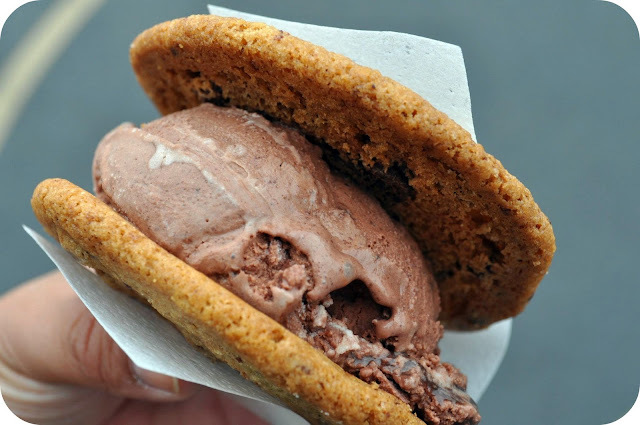 At the Cool Haus truck you pick your cookies and ice cream to create your personal ice cream sandwich. They have well-known flavors such as Tahitian Vanilla Bean and Chocolate Chip Cookies, but they also have some unique out of this world choices such as Guinness Chip or the Maple Walnut White Chocolate Cookie (SERIOUSLY?!). My brother and I compromised (more like he chose) on the Molten Chocolate Lava Cake ice cream on a Chocolate Chip Cookie. Beware. Those who are NOT extreme sweet tooths should not partake. It was definitely the most delectable ice cream sandwich I've ever had, but it was very sweet and rich. The ice cream is handmade so it probably has a higher butter fat than your run of the mill grocery store brands, but oh my goodness was it delish. It definitely emulated sinking your teeth into a molten chocolate lava cake. My best friend swears by this place and she was right. They totally delivered. So that's all the yummy treats from the festival. I wish I would have been able to stay longer but my tummy was full and my wallet was empty. Thus is the life of a foodie. I highly recommend all these trucks! If you haven't tried a food truck ever, then you need to become a chaser and find one STAT. There's a reason this method of eating has become so popular nowadays and you need to experience why. Let me know if you enjoyed this review or if you have any comments or suggestions for future reviews!